As the busy Christmas period approaches, retailers’ thoughts are beginning to turn towards designing their Christmas window displays. As well as showcasing the best seasonal stock and festive offers, your windows also need to convey a Christmassy feel to really get shoppers into the spirit. Christmas window stickers are a sure fire way that you can quickly and cost-efficiently add a professional look to your shop windows. As well as the usual Christmas designs such as Santa Claus, Christmas crackers, angels, stars and Christmas trees it is possible to create customised Christmas window stickers for your store. When you choose your own Christmas window decoration design, it can convey a promotional message as part of your overall marketing strategy for the festive period. Your shop windows are the first thing that your potential customers will see as they approach your premises, so it is critical to get them looking just right to draw in customers. Your windows say a lot about your company, and give your potential customers confidence in your product offering, your company’s professionalism and generate a desire to buy Christmas products. Your shop windows really are the starting point of the customer buying experience. Christmas window decorations can fulfil a number of different purposes: Not only do the simpler ones help those people who are doing their festive shopping to get into the right festive mindset to come and shop in your store, but they can also help your store to get more attention from passers-by. They may tempt new customers in, and remind existing customers of your Christmas offering. It goes without saying that clear and well-designed window stickers will also serve to clearly communicate and promote the festive range of products that you have to offer. Purlfrost offer retailers a wide range of customisable window stickers. A variety of predesigned templates are available on our website, which gives you the ability to design and create your own designs, and add your own customised text. A bespoke Christmas window sticker is a fantastic idea for any retail store, café or restaurant and it will really set off your windows this festive season. The high street is becoming an increasingly tough trading environment, and so if you are missing out on this cost-effective storefront marketing opportunity, then you are missing out on the possibility of converting many customers who may well decide to do their Christmas shopping with one of your more festive-looking competitors instead. Purlfrost shop window stickers are very easy to apply and remove, and the smaller ones can be easily installed yourself by your own staff. If you choose to purchase the self-cling variety of Christmas window stickers, then they are able to be taken off in one piece in order to be reused at a later date. This makes them an ideal investment for future seasonal activity and not simply a one-off purchase. The higher quality adhesive cut vinyl options that we can provide you are much longer lasting and look extremely smart and professional. The custom window sticker design tool on the Purlfrost website enables you to choose between all of the different colours and styles that we can supply. You can choose how much text you would like to be added to each of your Christmas window sticker designs, so you are able to completely customise the sticker to your specific needs. They can be made to precisely match your existing branding, and we can supply them in any size that you choose. When you design your adhesive Christmas window decorations online, you will be able to see an instant price based on your exact requirements. 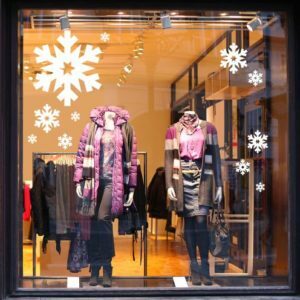 This simple purchasing process means that buying your stunning set of adhesive Christmas window products is a simple process, and installing them onto your shop windows is much the same. Christmas time only comes around once a year, and all of the retailers on the high street are competing for the same set of shoppers. Making your shopfront look as exciting and festive as you possibly can is an essential task if you are going to attract new customers and persuade them to buy from your Christmas range. A bespoke Christmas window sticker that is designed and customised to your exact specifications and matches your corporate branding will go a long way towards achieving the best looking festive storefront on the High Street this winter.